Birthdays can be interpreted in a positive or a negative way. The positive way is that you appreciate having one day a year that is strictly your day to celebrate your life and the amazing people in it. The negative way would be to focus on the aspect that you are aging and in a popular saying, “are that much closer to death.” Whatever the view of your own birthday, there are some birthdays that stand above all others and demand to be celebrated. In this blog, we will highlight which birthdays are the most monumental in your life and how Rythm EFX can help you celebrate these memorable days. Your 16th birthday is a big deal. In multiple cultures, the day you turn 16 is when you officially cross the divide between childhood and adulthood. Because this age is such a monumental phase of your life, people tend to want to celebrate this age. For instance, the “Sweet 16”, as it is called in America, is one of the biggest birthdays in a girl or boy’s life. These celebrations extend farther than just a small gathering of family and friends; there are some birthday celebrations that are massive and can be an extravagant event. Due to the importance of this birthday, it makes sense to put in little more effort to make it all the more unforgettable. Rythm EFX makes it possible to throw incredible parties using our special effects. 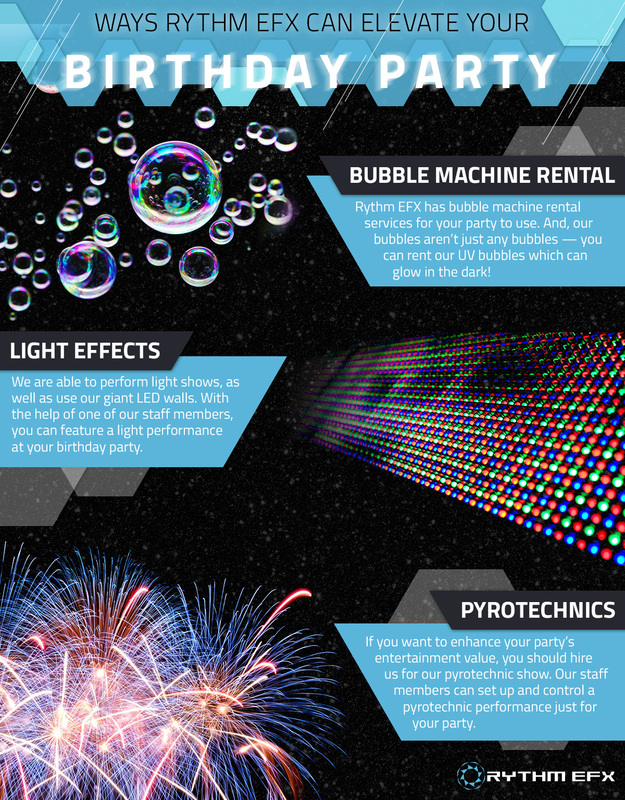 With our help, you can make a small birthday celebration turn into an incredible party with the help of lights, special effects, and yes, a bubble machine. Your 21st birthday is popular for very obvious reasons — you can legally drink and gamble. Due to the fact that your 21st is a time that you can finally party and go to a bar, these parties can get a little wild. The excitement of growing up can be overwhelming and this can lead to massive parties and memories that last a lifetime. Your 21st birthday is also a big deal, it is the moment that you are officially an adult. Because of this, it is important that your birthday party is a memorable one. At Rythm EFX, we offer our customer’s party rentals, such as party foam effects, CO2 special effects, and confetti cannons. With our help, your birthday party can be an unforgettable experience for all of your guests. As the movie 13 Going On 30 says, “Thirty, flirty, and thriving!” 30 is the official age when you are an adult and should be formulating the path your life is going to go. Meaning, 30 is when you should be directing yourself towards a career and figuring out what things in life make you happy. More than anything, your 30th birthday is an ode to your 20s, and thus should be a celebration to remember. The “Big 5-0” needs to be celebrated because it marks half of your life. Your 50th can be an extravagant party because it only happens once in your life. And, no, this birthday does not mean that you are officially ‘old.’ It means that you are now fully matured and can celebrate the incredible events and moments of your life. Rythm EFX can help you throw a memorable party for this important birthday by using light effects, bubble machines, and even pyrotechnics. And, if pyrotechnics and your birthday party seem like a dangerous mix — don’t worry! Our pyrotechnic Sparkulars don’t burn and won’t cause any flames. For an added safety measure, we also have our staff come to your party and oversee the pyrotechnic shows. You don’t have to throw incredible parties for every birthday, but there are some monumental birthdays that stand out against others. Rythm EFX of Denver, CO is here to enhance your birthday party experience and allow you to rent incredible special effects. If you are interested, contact us today.